Evanston/Skokie School District 65 board president Suni Kartha at a meeting last week. Kartha assumed a one-year term as president last week, unseating former president Candance Chow. 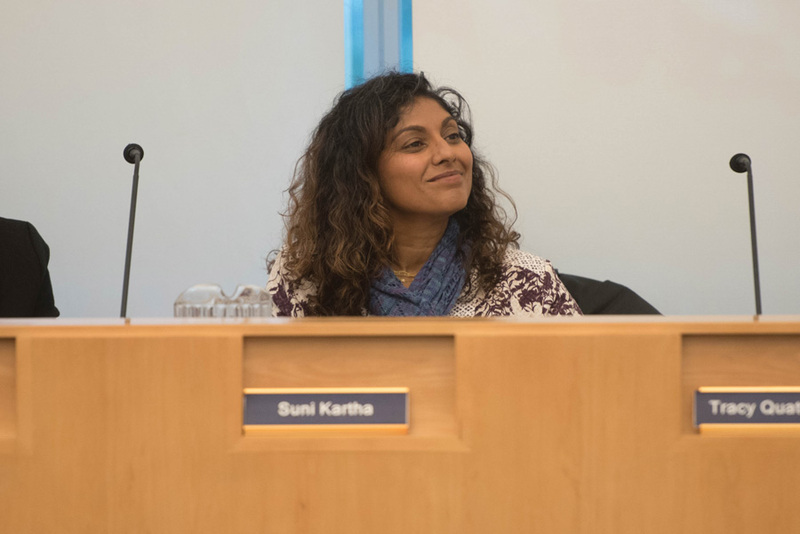 Serving others and her community is nothing new to Suni Kartha (Weinberg ’97), who was elected president of the Evanston/Skokie School District 65 school board last week. Kartha, who has two children in District 65 schools, has volunteered in Evanston schools and the community for years. In her new position, Kartha said promoting equity will be of the utmost importance. “The community embraces (equity), and I think we are definitely on our way to making some of those strides in becoming a more equitable institution,” Kartha said. District 65 school board members narrowly elected Kartha to serve a one-year term as president during a special reorganization meeting last Monday. Kartha replaced Candance Chow, and the board also elected Anya Tanyavutti vice president at last week’s meeting. Kartha, who has previously worked as an attorney, was first elected to the District 65 school board in May 2013. She volunteers with the Evanston Cradle to Career Initiative, which works to improve education and support for Evanston kids, and serves on the Board of Directors of Unity Preschool. She became interested in serving on the school board following a failed referendum effort in 2012 that aimed to build a new elementary school in the 5th Ward to be used by mostly minority students, Kartha said. The debate around that referendum helped her learn more about racial inequality in Evanston and inspired her to address issues of equity in the city, she said. The school board has worked during the past four years to address equity issues, Kartha said. She added that the district adopted an equity statement last year and is working on an “equity action plan” to train educators on equity, include underrepresented voices in decision-making processes and reduce the achievement gap. The district in 2016 had a nearly 50 percent composite achievement gap between black and white students, and a 41 percent gap between Hispanic and white students, according to the Illinois Report Card. “We need to work on narrowing those gaps … and continue to really look at how we can include equity and transparency in decisions,” Kartha said. Tanyavutti said she is excited to work with Kartha and the school board on increasing transparency and inclusivity. Tanyavutti said Kartha’s work in helping draft a policy on transgender students shows her commitment to equity. The Evanston Township High School/District 202 board passed a policy last week allowing transgender students to use the bathroom of their choice. The district avoided a series of potential budget cuts when a property tax referendum passed in April that will provide financial security for foreseeable future. The referendum passed with more than 80 percent of the vote and will raise annual property taxes by about $450 for the average Evanston property owner. The increased taxes will allow the district to work on improving student achievements, investing in technology and keeping class sizes small. Kartha said the district has a plan moving forward for managing its money and dealing with ongoing uncertainty related to school funding at the state and federal levels. Biz Lindsay-Ryan — who has worked with the district through her role as an equity consultant — said Kartha is a “behind-the-scenes worker” who has devoted herself to highlighting inequities in school funding and identifying solutions. Overall, Kartha said she is excited for the year ahead and ready to continue her work with the school board.